I am old enough and sufficiently familiar with Soho to remember a rakish nightclub called Pal Joey (or for even more ancient readers, Studio Valbonne) in Kingly Street. I was sure it had criminal associations and it seemed to close and reopen with astonishing frequency even for Soho. It is long gone. I have not been aware of anything occupying that space for a while, but now it houses the new Sadie Coles ‘HQ’ gallery. Through spectacular double height double doors and past lifting gear which presumably will allow the ingress of massive works in the future, you ascend to the first floor where once the bright and not so bright young things of the Old Millennium frolicked in the dawn of House music. It is now an open space running from the Kingly St entrance to the Regent St side of the building and it is a lovely view of Regent Street that you get through those arched windows. But before you get to the view, there is Art to negotiate. 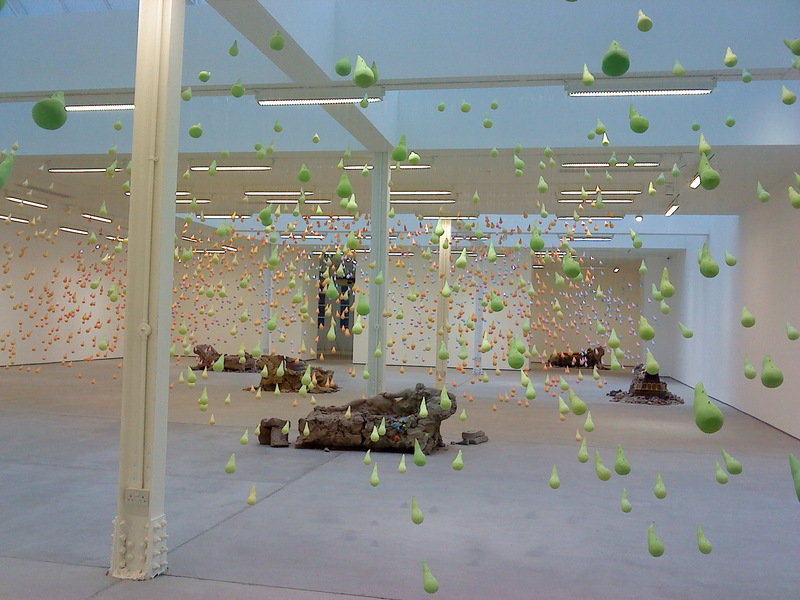 On show was an installation by Urs Fischer, a Swiss artist. Across the space several thousand concrete (ok, ok, they are plaster really) raindrops had been suspended on wires so that they filled the volume. The sensation of deep space was thrilling. The raindrops had been coloured in progressive pastel shades and were bright and cheerful, but the way they described the space was somehow classical. On the floor were a number of clay sculptures – reclining nudes on couches that were disintegrating, half made. The instability of the clay – returning to earth before our eyes – beneath the very solid rain was a very striking image. Well, they formed a single image in my mind, but they are not apparently part of the same work. I read the notes (fool!) and learnt this, and it detracted from my enjoyment of the exhibition for a while, the kind of thing makes me ambivalent about installations. For me the gallery showing an installation is the equivalent of the frame of a picture. Within this space, there is the work, outside is the world. It is an important demarcation. I like clarity about what I am seeing, and I didn’t much care for the idea of the rain or the sculptures on their own. But what is one work? Is there any one single indivisible work? Is an exhibition a single work that comprises a series of objects? I remember T.S. Eliot saying “the poem the reader reads is never the same one the poet wrote – it might even be a better one”. I am on the brink of admitting that the curating of shows is actually a skill – editing, juxtaposing and presenting frame the creative so that we have space (physical and mental) to apprehend the work. This show will stick in my mind. It was an installation, and a playful one. Usually I cannot endure playful installations, but this was charming. Perhaps I was in a light hearted mood, or more receptive in some way; but I think not. Perhaps the work was actually charming. This entry was posted in Art, Contemporary, Galleries, London, Sculpture, Uncategorized and tagged Art, Galleries, Kingly Street, London, Melodrama, pastel, raindrops, sadie coles, Sculpture, Studio Valbonne, Swiss, Urs Fischer.